The Jacksonville Jaguars disappointing last place finish in 2016 AFC South Division led to draft talks, coaching changes and a roster overhaul. Owner Shahid Khan has brought back a familiar face into the franchise – Tom Coughlin. He served as the inaugural head coach for the Jags when they made their debut in 1995 and remained with them till 2002. Coughlin led the New York Giants to two Super Bowl wins (XLII & XLVI) and the Jaguars are hoping that his magic touch can change their fortunes as well. As the Executive Vice President of football operations, Coughlin has the final say on all roster decisions. The 2017 season was the first for the Jaguars with new head coach Doug Marrone. They improved their record of 3-13 from 2016, finishing the regular season 10-6. They qualified for the postseason, playing the Buffalo Bills in the AFC Wild Card Playoffs. The Jags won 10-3, moving on to the next round and faced the Pittsburgh Steelers. The Jags proved to be tough, beating the Steelers 45-42. The Jags playoff run unfortunately ended when they faced Tom Brady and the New England Patriots. The Pats came out on top, knocking off the Jags 24-20. The Jaguars are looking to take this momentum with them in the 2018 season. They're aiming high and have their sights set on a Super Bowl trophy. To go along with battling the Miami Dolphins and the Tampa Bay Buccaneers for state bragging rights, the Jaguars will also have to beat out rivals the Indianapolis Colts and the Houston Texans for the division crown. Get your Jacksonville Jaguars tickets and head down to Everbank Field to cheer your favorite team to victory! Jacksonville Jaguars football history is brief with only 22 years into their existence. Despite many post-season hits and misses, the Jags have recorded several incredible moments that are still remembered by their fans. Jacksonville’s 1999 Season – Till now it’s the best season played by the Jags. With Tom Coughlin as the head coach, the Jacksonville Jaguars put on a remarkable display despite being a new expansion team. They finished the season 14-2, clinching the top position in the NFL. Anchoring the defense for the Jags was defensive coordinator Dom Capers; whereas, Mark Brunell, Jimmy Smith and Fred Taylor formed the Jaguars Big Three. The team’s 62 points and 55-point victory margin against the Dolphins in the playoffs is the second-most in NFL history. Winning two AFC Central titles (1998 & 1999) in a row, the Jags became the first expansion team to make four postseason appearances in its first five years. 2005 Return to the Playoffs – With the departure of Tom Coughlin in 2002, many believed that the downfall of Jacksonville Jaguars was inevitable. And with a 5-11 start in 2003, it even seemed that way. Under the new head coach Jack Del Rio, the Jags clawed their way up into the league and finally in 2005 managed to return to the playoffs. The Jaguars finished the season 12-4, once again dominating their division. It was the beginning of a competitive string of seasons for the Jags. 2014 Comeback Win against New York Giants – Gus Bradley stepped in as the head coach in 2013 when it was still a bumpy road for the team. But every now and then, the Jags would treat the fans to epic moments that kept them relevant. That moment came against the New York Giants at the EverBank Field on November 30, 2014. The Jaguars were down 3-21 at halftime and everyone was expecting them to be beaten into the ground. But the second half saw a different side of the Jags. They returned with renewed energy and fierceness, putting up 13 points on the board. With 48 seconds remaining in the fourth quarter, rookie Aaron Colvin and kicker Josh Scobee helped the Jaguars win 25-24 in front of 64,687 fans. The Jaguars share a rather professional rivalry with the Tennessee Titans than a fierce one. Fans also enjoy their thrilling encounters with the Indianapolis Colts. Jaguars–Titans Rivalry – The early rivalry between the two teams in the late 90s and early 2000s was a lot more intense. In those years their games had implications, like who will make it to the playoffs, who grabs the first place and who reaches the number one spot. In 2003, when Rashean Mathis joined the Jags as a rookie, he was given only one message – fans could tolerate a loss to any NFL team, as long as it wasn’t the Titans. In all these years the rivalry has simmered down as both teams struggle to remain competitive. Jaguars–Colts Rivalry – The Jacksonville Jaguars and the Indianapolis Colts play each other twice a year and the fans are treated to some nail-biting action. At the moment their head to head record is 10-22, Colts having an edge over the Jags. The divisional rivals engage in a thrilling battle every time they meet on the field. The early years of the Jaguars’ existence were filled with memorable events as big names like Fred Taylor, Mark Brunell, Jimmy Smith, Tony Boselli and Keenan McCardell led the side to impressive wins. Considered some of the best players in Jaguars’ history, they helped the team clinch two AFC Championships. Along with Taylor, Maurice Jones-Drew formed a powerful rushing attack and both find their names in the best running backs of all-time list. Since their formation in 1995, the Jacksonville Jaguars have been playing their home games at the EverBank Field. Conveniently located in downtown Jacksonville, this 67,000 seat stadium is a perfect place to enjoy a Jaguars game. Fans can visit the iconic Jaguar statue that is situated in front of EverBank Field. Renovations were made to the stadium so that they could host Super Bowl XXXIX. Some of the additions were a 25,000-square-foot sports bar called the Bud Light Party Zone and a 20,000-square-foot Sky Patio. The NFL dropped the 2018 schedule. The Jags are hoping to improve on their impressive recent season. Fans are keeping an eye out for the Jacksonville Jaguars Season tickets and looking forward to another playoff appearance. With Tom Coughlin leading the pack, the fans are keeping their expectations high. Our process for purchasing cheap Jacksonville Jaguars tickets is simple and fast. There are so many online ticketing sites, that it can be hard for customers to find the right place to buy Jacksonville Jaguars tickets at the cheapest price. At ScoreBig we think of our customers first and foremost. We offer daily deals for Jacksonville Jaguars events, so our customers can get the best seats for the best prices. ScoreBig will always go above and beyond to offer the cheapest Jacksonville Jaguars tickets on the market. The Jacksonville Jaguars schedule above, displays all available events for 2019 and 2020. Once you find the event that you would like to go to, click the red “Get Tickets” button. It is located on the right-hand side of the event listing, it will take you to an Jacksonville Jaguars event ticket page. ScoreBig's event ticket page will display all available Jacksonville Jaguars tickets for that event. 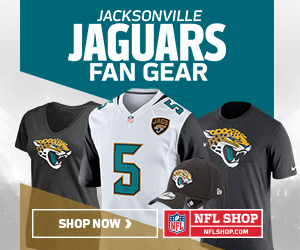 On the event ticket page to help with your search for the right Jacksonville Jaguars tickets, use the filters at the top to select quantity, price range, and more. There is also an interactive seating chart so you can pick where you want to sit. When you are ready to buy a ticket, click on the listing, and you will be directed to ScoreBig's checkout page. Upon completion of the information fields, your order will be processed and your Jacksonville Jaguars tickets will be delivered via email, mail, or to your mobile device. What makes ScoreBig’s site stand out from the rest? We are constantly analyzing our competitors to improve our site, service, and prices. ScoreBig.com employees strive to offer the best process and experience to buy cheap Jacksonville Jaguars tickets. Our goal is to get you the best seats to Jacksonville Jaguars events. We offer daily discounts on our site and for special promotions check out our newsletter. If there are no Jacksonville Jaguars events currently available, you can use our search feature at the top of the page to see a list of all popular events going on near you. No matter your price point, we have all the best deals and discounts on Jacksonville Jaguars tickets. For more information on prices of Jacksonville Jaguars tickets and the schedule for Jacksonville Jaguars, check out our listings above. The last thing you want to find out is when the Jacksonville Jaguars event you wanted to go to is sold-out. Don’t worry in many cases ScoreBig has affordable tickets to sold out events. We sell tickets from GA all the way to premium seating and parking. Skip the scalpers in the parking lot and get your tickets online from top Jacksonville Jaguars ticket brokers. We get you in all events, buy your Jacksonville Jaguars tickets here from a brand that many trust and rely on for all their ticketing needs. ScoreBig offers a 100% money-back guarantee. If you have been in search of cheap tickets for Jacksonville Jaguars, ScoreBig by far is the best option. That’s why ScoreBig has more loyal customers than any other ticketing site. Shop at ScoreBig for safe and secure Jacksonville Jaguars event tickets.